On January 11, Secretary Designate of the New Mexico Department of Workforce Solutions Bill McCamley visited UNM-Los Alamos (UNM-LA), where he met with representatives from UNM-LA, Los Alamos National Laboratory (LANL), N3B, the Los Alamos Commerce and Development Corporation (LACDC) and Los Alamos County. 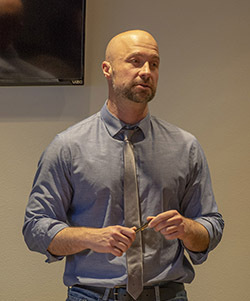 McCamley plans to start his position with Workforce Solutions with an understanding of the needs of communities, businesses, and educators throughout New Mexico, and is traveling throughout the state asking stakeholders, “What is working? 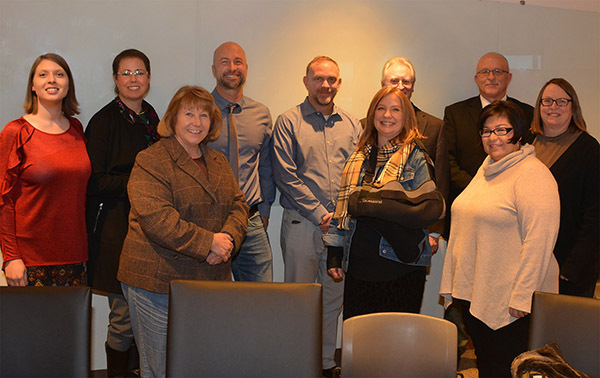 What is not working?” In Los Alamos, the discussion centered on the employment needs of LANL and N3B and educational options to get more workers trained, with a focus on apprenticeship and internship programs. UNM-LA CEO Cindy Rooney and Student Success Associate Grace Willerton discussed past grant-funded programs which had been successful in providing the education, training in soft skills, and internship positions for UNM-LA students: Accelerate, funded by the US Department of Energy, and the STEP program, funded by New Mexico Tech. Currently, the Community Internship Collaboration (CIC) provides an opportunity for students to intern with local business mentors. David Clark of the National Security Education Center at LANL shared statistics about their personnel. LANL annually employs 1880 students, from high school through post-doctorate. Post-docs fill about 20 percent of their work force. Through an evaluation, LANL discerned that 50 percent of their entire workforce formerly worked as students or post-docs at LANL. Clark said, “Student employment is a valuable pipeline.” LANL will be hiring 2000-2500 new employees in the next few years. LANL Director of Community Partnerships Kathy Keith, addressing the need for more students studying for STEM careers, said “We need to get students focused earlier. When they are in with 8th grade they need to have someone tell them, this is the path to take you to this career where you earn this much money.” McCamley offered the possibility of placing a STEM champion at every school, who would promote and coordinate STEM education. McCamley also stressed the need state-wide for more health care workers: nurses, med-techs, and behavioral health workers. Currently, UNM-LA is working to address this shortage with the Certified Nursing Assistant (CNA) and Personal Care Attendant (PCA) program. Rooney noted that the campus continues to explore the possibility of expanding programs related to health care.